It’s been a hectic week of meetings, errands and driving long distances in the pouring rain. I craved some comfort food and decided to go with arroz con pollo or chicken and rice. 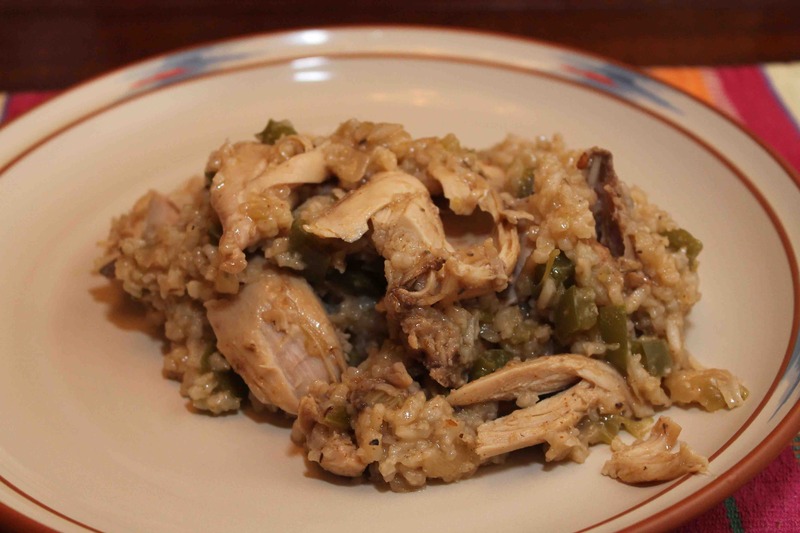 There are a number of ways to do this Latin American dish – I have recipes for Mexican, Puerto Rican and Cuban versions but I’m descended from colonists, so I just took the things I liked from many different recipes. I’m doing this particular version as I didn’t have any homemade chicken stock on hand. Normally, I would brown/cook the chicken in the Dutch oven about 8-10 minutes per side to start and then remove it to pick it from the bones. Don’t worry if it is a little pink, as it will continue cooking with the rice. Then, I would sauté the onions in the butter and would follow the rest of the directions as written from that point. 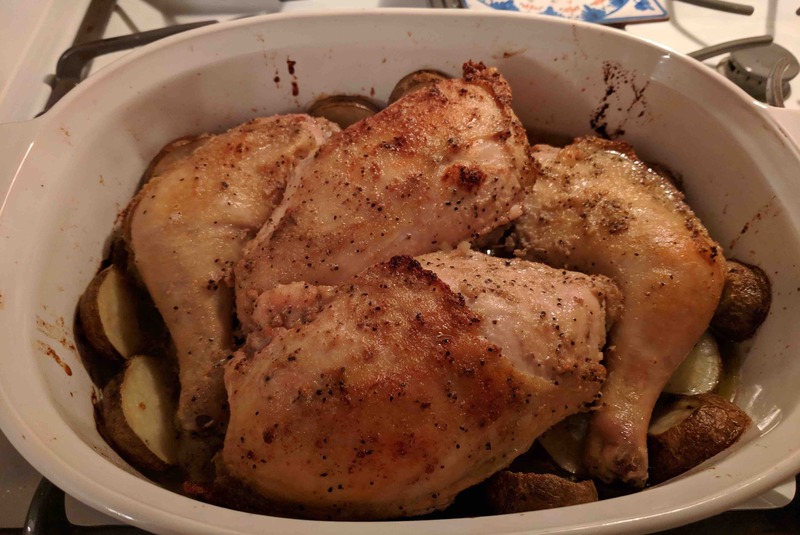 You need 4 cups broth for this recipe and the seasonings I’ve put in add a ton of flavor to the chicken but feel free to use any good, low salt chicken broth. Don’t skip rinsing the rice – trust me, it is important. It has a coating of starch that, if left on will make the dish very sticky and gummy. Additionally, by toasting the rice before adding the liquid, it should leave the final result nice and fluffy. I used Goya Sazón. It is a spice blend common in Latin American cooking. You could make your own blend (see a recipe here) if you want to avoid the monosodium glutamate (MSG) but the Goya Sazón with Coriander and Annatto (on the package written as con Culantro y Achiote) adds a nice flavor and pretty color to this dish. 1 tablespoon is equivalent to 3 of the individual packets. 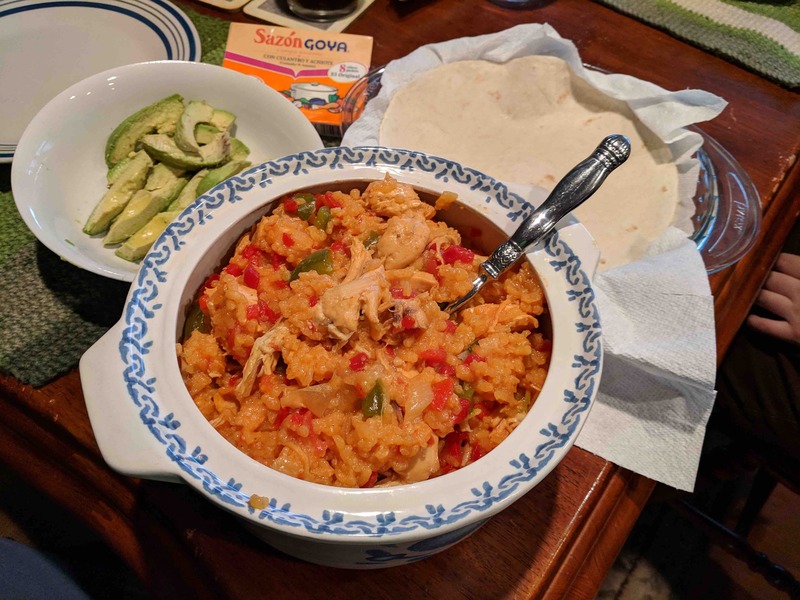 I served the arroz con pollo with tortillas and sliced avocados. Place the chicken in a large pot of Dutch oven with six cups of water. In a blender, add the quartered onion, celery, garlic, cumin, salt and pepper. Blend on high speed until pureed and then pour into the pot with the chicken. Bring the pot to a boil over high heat. Reduce heat to medium low and boil gently, uncovered, for 45 minutes or until chicken is tender. Skim off any fat that rises to the surface. Remove chicken from the pot and pour the liquid through a strainer to remove the solids. 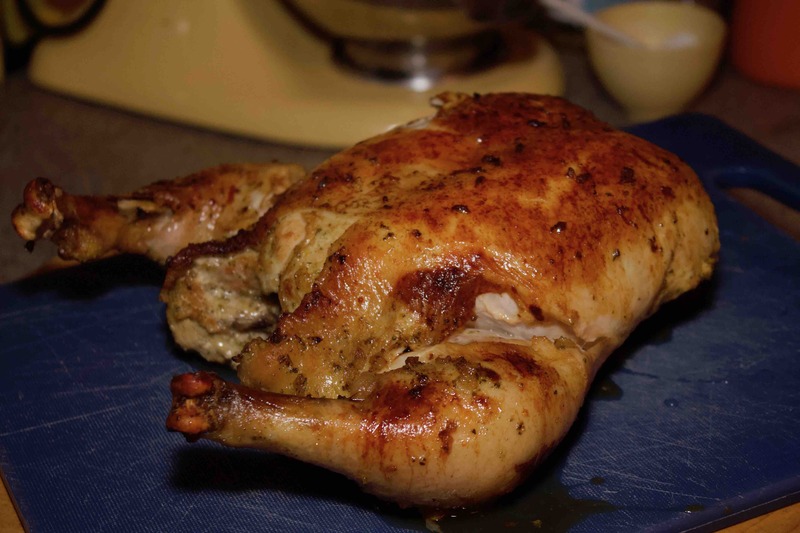 Once the chicken cools enough to handle, remove skin and bones and shred the meat into bite sized pieces. Measure out 4 cups of chicken broth. Return pot to the stove and melt the butter. Add diced onion and cook until softened and translucent, about 5 minutes. Add in garlic and cook just until fragrant, about 2 minutes. Stir in rice and Sazón and cook until rice begin to toast, about 2 minutes. Pour in chicken broth and stir in the bell pepper, can of tomatoes (with the juice) and reserved chicken. Bring to a low boil. Cook, covered, until the rice has absorbed the liquid, 25 to 30 minutes. Stir in the pimentos and let stand off the heat for 10 minutes before serving. Scrape the bottom of the pot when portioning out, as the crunchy, caramelized rice has fabulous flavor. 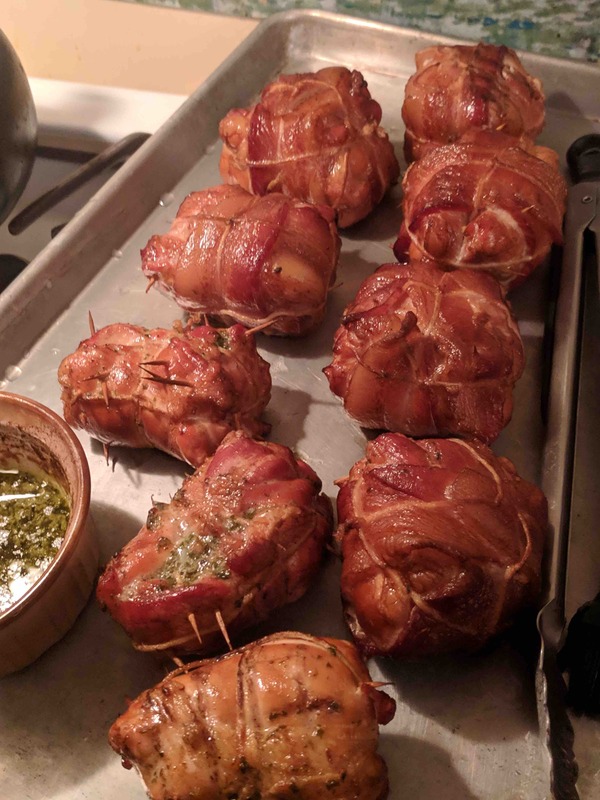 I was able to get a lot of sage for a little money and have been going wild with recipes. 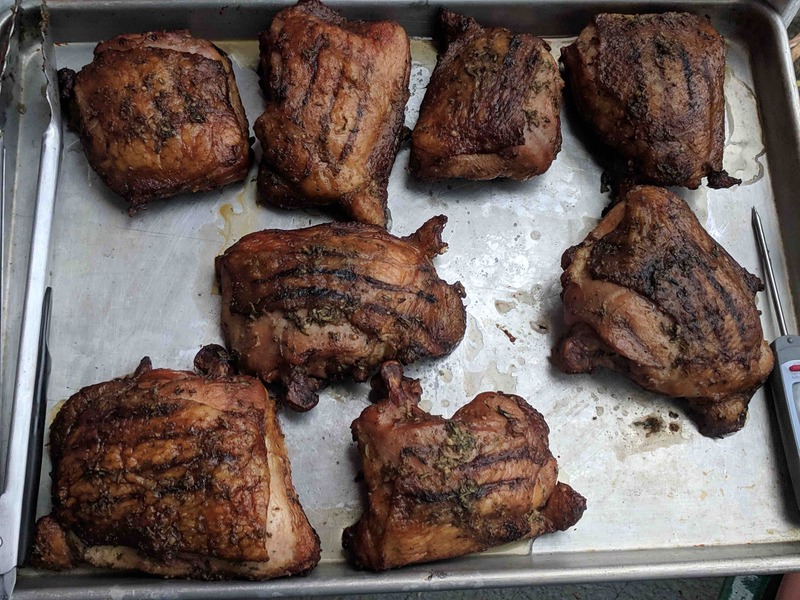 This is one of the few chicken recipes that I didn’t brine but I did marinade it overnight, so there is plenty of flavor and it didn’t dry out. I served this with roasted Brussel sprouts and baked sweet potatoes. Spatchcock the chicken by cutting out the backbone. Finely chop lemon zest, sage leaves and garlic. Smush together with the salt. You can use a food processor to get everything good and chopped. Mix with the olive oil and lemon juice. Place in a zip top bag with chicken and place in the fridge to marinate for 24 hours. Pull chicken from refrigerator about an hour before cooking. Preheat the oven to 400 degrees F with a cast iron skillet in the oven. Remove chicken from marinade and set in the hot skillet, breast side up. Press down on the breastbone to get it to lay flat. Roast for 20 minutes. Baste with pan juices. Continue to roast and baste after another twenty minutes. Drop heat to 325 degrees F and continue to cook until done (internal temperature should be 165 degrees F in the thighs) about 30 minutes more. Let rest for 10 minutes before carving and serving. I have a serious amount of satsuma juice from my Dad’s tree, so I used a quart of it for a brine for the thighs from a 10lb bag of leg quarters. Of course, you can easily substitute orange juice or, if doing pork, switch to apple juice if you aren’t lucky enough to have satsuma juice at the ready. The satsuma adds a brightness to the brine without adding too much acid plus the lemon goes really well with sage and chicken. Bring the water, salt, brown sugar and peppercorns to a boil. Stir to dissolve the sugar and salt. Remove from the heat. Add in the satsuma (or orange) juice and ice cubes. Stir to melt the ice. Once the brine has cooled, add the meat and refrigerate. Brine for 12-24 hours. Remove the chicken from the brine the morning before grilling and rinse it off. Place it uncovered in the fridge to dry the skin out a little. 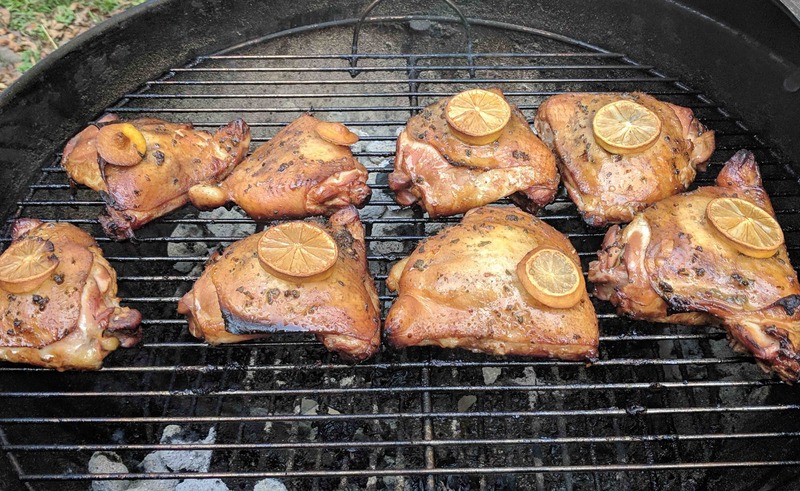 About an hour before prepping the grill, pull out the chicken and let it sit on the counter. Set up the grill for indirect cooking with coals on two sides and some hickory chunks soaking. To prepare the wet rub – combine the lemon zest and garlic cloves on a cutting board. Mince them together. Add the salt and chopped sage leaves and use the side of the knife to work the herbs into the garlic to make a paste. Place the paste in a bowl with the juice from one of the lemons and the pepper and olive oil. Whisk to combine. Rub over the chicken thighs. Once the coals are ready, place the thighs skin side down on the center of the grate. After 10 minutes, flip them over and place thin slices from the remaining lemon on top. Continue to cook for 45 minutes to an hour or until done. Chicken thighs are at a safe temperature when they reach 165 degrees F. Because of the brining, you can let them go all the way to 170 degrees F without drying them out. For serving, squeeze the lemon slice over the thigh for a bright hit of lemon.